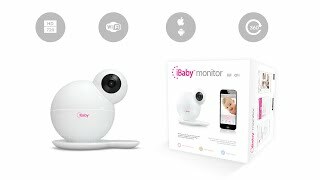 720p High Definition Clear Video - See your baby sharply in every detail with iBaby Monitor M6T’s HD 720p video. The monitor’s night vision feature will allow you to check on your baby at night as well. 360º Full View - No need to go to the baby’s room to adjust the view from your monitor. You can easily turn your monitor 360° or tilt it up to 110° from your mobile device. You can also zoom in for details. Easy And Quick Installation - iBaby Monitor M6T can be set up in about 60 seconds without going through manual guides. You will be conveniently guided through the installation process by the app. Temp And Humidity Sensor - Want to securely share your video feed with friends and family? The monitor allows you to invite unlimited number of users by sending them an email invite. Smart Alerts - With sound and motion sensors, the smart monitor will know when something is happening in the baby’s room. The alerts will be delivered to your mobile device and you won’t miss them. Two-way audio with echo cancellation. Photo or video alerts log timeline. Add Unlimited Users To View The Monitor - Want to securely share your video feed with friends and family? The monitor allows you to invite unlimited number of users by sending them an email invite. Additional Privacy With Sleep Mode - If you are having a moment with your child that you don’t want others to see, we have a solution. Turn on Sleep Mode and no one with the access to your monitor will be able to see the video. Lullabies And Bedtime Stories -Babies love music! - iBaby Monitor M6T features Music Player with 10+ lullabies and short stories to play to your little one. You can also record your own audio to be played later. Record videos, and take photos and social share. Receive alerts even when you’re talking on the phone.